About 30 myki users have been affected by a particular fault that has allowed them free travel. Public Transport Users Association president Daniel Bowen has been travelling free for at least a week. Kamco became aware of the problem only when Mr Bowen reported it. He said he was surprised to see that no money was being deducted from his account when the card appeared to be working normally. I had a Myki Pass (like a Monthly Metcard) loaded on my card, which expired on the Friday 8/10. My next travel on Monday 11/10 was correctly charged, and I kept travelling that week. The next time I checked my card’s transactions was on Monday 18/11, and I was surprised to see the balance hadn’t shifted since the previous Monday; it was still at $39.40. I checked this both online on the web site, and on the system, eg direct from my card on a Myki Check machine (since sometimes the web site is problematic getting updates from the scanners on the system). Then I flagged it through a contact at the Transport Ticketing Authority. I kept travelling on the card while they investigated, and it kept letting me travel for free. Apart from a slower response time (about 3 seconds instead of typically about 1 second), everything seemed normal. The beeps at the standalone scanners said it was okay; the station gates would let me through — including the new Myki-only gates at Parliament. But my balance wasn’t going down. In fact, it went up; two payments of $5.88 got added; they appear to be long-awaited compensation payments for previous claims from Metro. Perhaps the card’s slower response time and the payment problem are linked, but it wasn’t obvious, because the slow response time problem had actually appeared about a week before the payment problem started. What magic did I do to get the free fares? Nothing; I just used it. 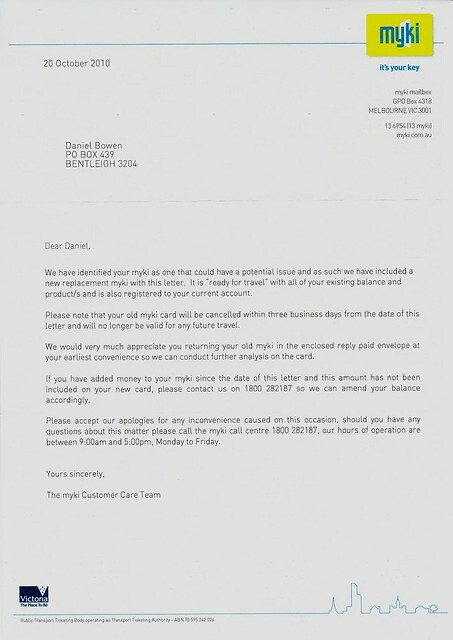 The article notes that the card was affected by a software problem on a “small number” of gates. So how many others might be affected? One thing I did notice today is that it did charge me a $2.02 default fare (which is a zone 2 two-hour fare) for a failure to touch-off. In other words, it appears the card was giving me free travel for zone 1 only — possibly it was linked to the previous Zone 1 Pass that had been on the card. How many cards are affected like this? TTA/Kamco claims 0.01%, or about 30. But it’s not clear how they derive that figure. More critically, are they detecting these cards themselves, or is it up to people to first notice the problem, then report it? That’s not clear, but what is known is that mine had the problem for almost a week before it was noticed. They’ve now sent me a replacement card, which arrived yesterday. With it was a generic letter basically saying that my current card might be problematic, and they want it back to study (and will deactivate it shortly anyway), and that they’ve transferred my balance across. Which is fine for me, but I can’t help wondering just how big this problem is. I heard a soundbite of Brumby saying something like “if it’s only 30 out of 500,000 then it’s a very small percentage”…. LOL but I have to assume only 30 people have reported it. After all this time, Myki is still unreliable. If there were as many issues with debit cards, everyone would still be writing cheques. I’ve been advised by the Myki call centre not to touch-on or off on the bus in the evening from Bentleigh, because the bus still doesn’t know where zone 1/2 overlap stops & zone 2 starts. For every 5 minute trip home each night, I was spending 10 minutes on the phone getting the $2.02 re-imbursed. Although they did call me to inform me the problem was fixed, and i started using it again… it wasn’t and was advised again to stop using it…. I wonder if the software compensates automatically so that for every free trip you were getting, someone else gets overcharged? Yay, what a great government! Four more years of this tripe? As someone who got a Myki when they were free but is still waiting for the system to be stable enough to rely on, I got an email from Myki the other day showing the great savings over Metcard on 2 hour and daily tickets. As I always use monthly or yearly metcards, I followed the link to look at the savings there. I cant believe I’ve wasted this time when I could have been using it – I could have saved up to $3.00 a year!!!! C’mon kids, we’re going to disneyland! At least if it is undercharging people everyone will be jumping up and down to report the problem so it will get sorted out quickly. If this is really a problem that is only affecting a handful of cards it’s not particularly more problematic than some of metcards faults, i.e. cards that wont validate that people carry around knowing they won’t get fined. Although I wonder what would have happened if an AO had scanned your card. Would it have shown it as validated? Ha Ha! Good one Daniel. It’s funny that a faulty myki was owned by the president of the PTUA. – Why can’t their computer pick up 8 consecutive instances of travel with “zero” fare and flag as problem? BTW, regarding Alisdair’s problem (bus not knowing what zone it’s in), how is a bus supposed to know where it is? And can it know it’s in 2 zones at once?? @Alasdair, yeah I saw the same problem on the first day Myki was switched-on on buses (and trams). It’s to do with the transitional nature of the bus setup; it doesn’t properly know where it is and which route it’s on. You can use the web site to submit your problem when an overcharge occurs, which will probably save you some time. But probably the best solution is just to stick to Metcard for now. 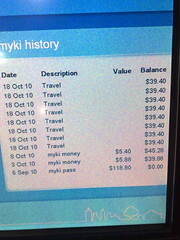 As Shell notes, Myki offers no money saving for regular (weekly/monthly/yearly) passengers. @Shell, yeah, what were the odds? Mind you I’m not totally convinced it’s really a 0.01% problem. @Julian, from what I could see, the card behaved normally in touching me on and off; it just didn’t charge me. I think it thought my Zone 1 Pass was still active. @Roger, in theory GPS is used so the bus knows where it is, combined with information entered by the driver about which route it’s on and which direction it’s heading. But this latter info isn’t available while Metcard and Myki are both running, as the full Myki console isn’t available to the bus drivers. Similar problems on trams, but there the zones are simpler. I still don’t know why they couldn’t just copy something like the Oyster card system used in London. Even if they had to pay a fee to use the Oyster card system here, it would have been way cheaper than the money we’ve wasted on Myki, and we would have proven technology. So now you will have the joy of a second dead card showing up on your online account for the next 7 years. No matter how hard you try, they will refuse to remove it – something that the banks seem to have no problem doing with lost/expired/replaced Credit Cards. And now that you’re on Myki Money, welcome also to the joy of never being able to tell when your 2-hour ticket expires. @Liz, it’s not up to Metro to switch the tickets; that’s entirely up to the TTA. Yes, Commuter Club Yearlies are still being issued as Metcards. Don’t hold your breath for a switch. I’d be very cranky if I was working away from home for a week and suddenly found my myki to be mysteriously inoperative after 3 days. What is the purpose of photocopying the front and back of the ticket ? Good question ! Very difficult if you work in a factory or outdoors or a pensioner and don’t have easy access to a free photocopier at work. Since when is $39.40 on your card “no money” ?